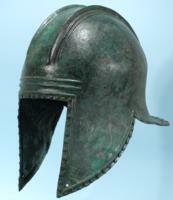 Hixenbaugh Ancient Art is pleased to announce the release of the new book by Randall Hixenbaugh and illustrated by Alexander Valdman: Ancient Greek Helmets: a Complete Guide and Catalog. 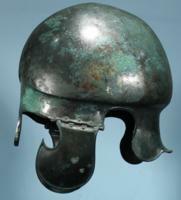 It is most comprehensive study ever produced on the subject of ancient Greek armor, tracing the development of the ancient Greek helmet from the Bronze Age through the Hellenistic Period, cataloging over 2150 ancient Greek helmets in both public and private collections, examining every aspect of the design, manufacture, use, and cultural relevance of the military helmet in ancient Greek culture, with 144 figures and 712 original color illustrations. 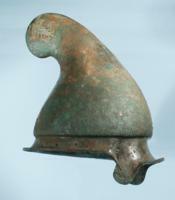 The book release is in conjunction with the opening of the exhibition: Ancient Greek Helmets, which presents a large and important selection of authentic ancient Greek helmets, a selection that rivals the finest museum collections, representing each of the distinctive ancient Greek helmet forms spanning the entire period of their production and use on the battlefield. Also on view will be the original artwork, photo-realistic gouache paintings of ancient Greek helmets, by the artist Alexander Valdman. Over 700 of his illustrations are included in the book. The photography of Joseph Coscia Jr. The GODDESS exhibition features sculpture of of the divine female form in antiquity. On view exclusively at our Chelsea gallery from April 16th to May 30. Our inaugural show in our newly opened Chelsea gallery, on view now through April 11th, explores the widely varied depictions of the human face in ancient art. 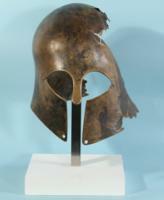 Our current exhibition includes a number of rare and unusual examples of ancient arms and armor including, Greek bronze helmets and horse armor, Roman legionary bricks, Celtic swords and spears, as well as a number of ancient projectile points.